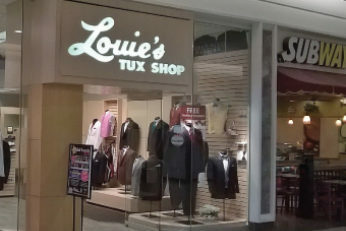 Louie's Tux Shop on the lower level of Southlake Mall in Merrillville is located across from H&M, next to Subway and near JC Penney. This location provides tuxedo rental services in Merrillville for proms and weddings along with wedding invitations, wedding accessories and bridal party gifts. All tuxedos and formal accessories are on display along with formalwear consultants ready to assist your wedding, prom, quinceanera and black tie needs.